Y’know, when Halo: Nightfall originally released, I, like many, wasn’t too sure what to make of it. I didn’t dislike it, but I wasn’t swept off my feet the way I was two years prior when Halo 4: Forward Unto Dawn gave us Halo’s first foray into a feature-length live action production. That was a new and unexpected feeling. Nightfall’s reputation sort of settled on a default negative in the fanbase and there haven’t been very many thinkpieces on it, so it’s a text that has sort of fallen by the wayside. I’ve always regarded Nightfall better than most and I want to give it its due. I rewatched it four times over the last two weeks in order to formulate my final thoughts, which are currently spread across fourteen whole pages of notes, so this is gonna be a long one! Before we get to Nightfall itself, let’s review some of the context that I think somewhat sabotaged this film’s reception from the start. Firstly, a series of escalating expectations as to what this would be about didn’t particularly get things off to a good start. There was a lot of speculation about what the enemy would be, with a lot of things naturally pointing to the Flood – which is what expectations built around, as this was supposedly set between Halo 4 and Halo 5 (though the date that Nightfall takes place is in 2556). In the SDCC 2014 Nightfall panel, Frank O’Connor was asked in the Q&A about the enemies that would appear on the Halo ring, to which he said we would see some “familiar threats”. Now, what he said was absolutely right, but the natural mix of going back to Installation 04 in a live action Halo film… about survival… with Ridley Scott’s name attached to it naturally led many to believe that the Flood would be returning. They likewise played down Halo 4: Forward Unto Dawn as having “a fairly light connection” to Halo 4 in order to emphasise how Nightfall will link to Halo 5: Guardians, which it, y’know, didn’t, particularly in-comparison to Forward Unto Dawn. And then there’s the ‘pitch’ for the series, which has little-to-no reflection on the film proper. And then there’s the bioweapon (which isn’t really a bioweapon but let’s just roll with it), which looked to be a major aspect of the plot that would be relevant in the Halo 5 ‘period’ of fiction. At the time, Halo: Escalation appeared to be concluding with issue #12 – the Exposure arc where Naiya Ray and Gabriel Thorne uncover a bioweapon. Serin Osman says “We haven’t ever encountered a bioweapon of this particular nature before,” and the story ends with the revelation that ONI staged the whole thing in order to motivate the UNSC to escalate attacks on Kig-Yar pirates. Overall, the picture that was painted for what Nightfall would be about didn’t really match what it actually was about, and it’s really difficult to divorce one’s perception of the film from those expectations that we were never given cause to believe were frivolous. Note that I will be referring to Nightfall as a film in this article, as this, unlike Forward Unto Dawn, was not made to suit the format of a web-series. It was shot as a film and then cut up into five parts, which is another reason why I think it never seemed like Nightfall stuck the landing upon release. Having rewatched it as a film, I can absolutely say that it’s meant to be watched through in one sitting and not split up into fifteen-to-twenty minute chunks – quite the opposite of Forward Unto Dawn, which works a lot better as an episodic story than as a film. Of course, there are going to be those who simply didn’t connect with Nightfall, and that’s okay. But, for me, with the benefit of having had almost three years to look at this film without the baggage of what was going on in the lore at the time setting false expectations, I think the story that Nightfall does give us is not only underrated, but… actually really quite good. Hear me out… What is Nightfall about? That question is answered within the opening lines, in Randall’s first soliloquy. But what if the next time that sun rose, there were no possibilities at all? Only death. Yours, and of everything you’ve ever known. How would you act in that darkness beforehand? How would you go out? We are simple things, soldiers. We are taught honour. Honour means sacrifice, sacrifice means death – either our own, or our enemy’s. In some ways, beneath it all, that’s all a soldier’s really trained for. To undo all of God’s work. To take life, where only God can give it. Nightfall is, as Mike Colter described it in the SDCC 2014 panel, a sort of “superhero origin story” for Locke, and so it thematically reflects a number of other origin stories told within Halo. Indeed, Kiki Wolfkill said in the same panel that Nightfall deals with themes that “are important for us in Halo that we try and seed through all of our efforts” (4:35-5:07). The Fall of Reach, Ghosts of Onyx, Contact Harvest, The Cole Protocol, Forward Unto Dawn, Cryptum, Rise of Atriox… these are some of Halo’s big origin stories that all deal with the same questions and find many different answers that inform the character arcs of whom the question is being asked. What does it mean to be a soldier? What, when faced with losing everything, will you die for? Randall’s soliloquy begins with the mention of a million possibilities forming with each new day, and of a day where every one of them is taken from you. This is something of an integral aspect of Randall’s character, which is expanded on a bit later in the film. ‘Randall Aiken’ was formerly known as Randall-037, one of the Spartan-IIs conscripted into the program at the age of six. He has, in fact, been featured in the series before – in Halo: Evolutions, the anthology novel, in the story Pariah. “How’s Randall doing?” [Doctor Halsey] asked. Mendez snorted, lips curling back into an almost predatory smile. “He’s fine. Kicking himself for letting his guard down a little, but there was nothing he could have done and as far as I can tell, he didn’t let down much. He might have taken Soren-66, but couldn’t take both him and somebody armed with a tranquilizer. He did what he could. It’s good for him to go through something like this. During the Human-Covenant war, Randall ended up going MIA during the battle of Vodin in 2532. During the orbital engagement between the UNSC and the Covenant, Randall fell from one of the planet’s skyhooks and fell into the ocean, where he was recovered by local survivors. Randall chose to stay with the survivors on Vodin, which remained isolated and remained out of contact with the UNSC for almost a decade. During this time, Randall forged meaningful ties with these people and even fell in love. They eventually reestablished contact with the UNSC, but Randall had no intention of going back to them and so he kept a low profile. Randall and his wife had a daughter – Natalie – in 2545 (the mother dying in childbirth), and the UNSC managed to locate him the following year where ONI planned to reintegrate him. Randall, however, refused. He was deemed to be ‘compromised’ and the plan changed to have him ‘decommissioned’. To be a Spartan-II, to have that much invested in you by the UNSC, to be their soldier, is to be their property. We don’t know exactly what occurred following this, but we do know that Randall eventually managed to wrangle a compromise that was approved even by Margaret Parangosky. His Spartan-II augmentations were ‘reversed’ (a general term that caused much ire in the community, though it would seem to be more accurate to say that their effects were greatly reduced) and he was released from service; he and his daughter moved to an Outer Colony known as Sedra, eventually becoming a Colonel in service to the Colonial Guard, which is where our story picks up. I bring up this backstory because it gives Randall’s opening soliloquy real meaning beyond just setting up the themes of the film. He speaks of “a million possibilities”, yet had all of his taken away from him when he was conscripted to become a Spartan-II. It was only when he was cut off from the UNSC, pulled from the sea by the people he was fighting to protect, that he was presented with the unique opportunity to start anew. It sounds like a story out of folklore, which I love. And when the UNSC came knocking at his door once again, almost fifteen years later, to bring him back to the fold, he fought back and won. Randall not only reclaimed his agency, but managed to hold onto it when ONI looked to take it from him again, and was able to start a new life with his daughter. That is, until ONI turned up at his door for the third and final time… At the end of this prologue scene, we see Natalie with the beaded necklace that comes back in the third act – where Randall uses it to act as the ‘straws’ that he, Locke, and Macer draw as part of the ‘lifeboat rules’ agreement. Already, within the first minute, we’ve got several major pieces of set-up established purely through the visuals and Randall’s soliloquy: the theme; the lens through which this story will be told; the central questions that define the characters and their dilemmas, and the importance of children and childhood. Family is one of the core themes in all of 343’s fiction (other major ones being ‘duty’ – or ‘responsibility’, if you prefer – and ‘home’). Nightfall sets about grounding these right from the start because they are relevant throughout the story. These are things that you don’t necessarily catch the first time you watch it, which is why Nightfall is a text that really rewards rewatching. For me, when I go through a piece of media (particularly for a long-running series), I like to sort of ‘tune’ myself into seeing the structural and thematic elements that build the narrative from the writer’s perspective. A lot of people tend to just look at a plot, the events that happen, and judge the work primarily on that. And that’s a totally valid way to consume media, particularly for those who consume a lot of it – whereas I personally struggle to keep up with all the goings on in the countless major films and television shows and games (I weep daily over the size of my media backlog) that I generally end up getting around to months or years later. I’m a bit more methodical with my approach to an individual piece of media, so trying to ‘tune in’ to its aspects of narrative from the perspective of the writers is what I find rewarding. Anyway, back to the film, what follows this prologue scene is a quick bit of text meant to bring people up-to-speed on the setting and provide general information about Halo for newcomers to the franchise. It is the 26th century. Prolonged war between humanity and the fanatical alien alliance known as the Covenant has ended with a tenuous treaty. Despite the ceasefire, Earth’s outer colonies remain vulnerable to the Covenant’s covert intrusions. The Office of Naval Intelligence, or ‘ONI,’ has been tasked with counterintelligence to beat the Covenant at their own game. It’s naturally something of an eye-roller to the well-initiated Halo fan for its very generalised description summing up the Halo universe, but these things can be necessary for such a huge transmedia franchise that runs the risk of coming across as intimidating to get into for newcomers and fans alike. It’s just an added bit of utility to the establishing shot of Sedra from space and doesn’t take up any more time than it needs to. We are then introduced to Locke and his team. Cleverly, Paul Scheuring (writer) and Sergio Mimica-Gezzan (director) are quite particular about the order in which we are introduced to Nightfall’s characters in these opening scenes through dialogue. We’re introduced to Randall first (as he provides the lens through which this story is told), Locke second (the protagonist, obviously), and Horrigan (the – eventual – antagonist) third. We see Estrin and Ramos before Horrigan, but he is the first to speak. He’s the voice and sower of discontent (more on that later). These are the three main figures in the conflict as it evolves over the course of the film. This is the point where Nightfall undoubtedly lost some people, as it’s where we’re introduced to the Yonhet – or, if you prefer a more transparent description, a man in a costume that’s a lot easier and cheaper to manage than having to use more CG budget on a client species of the Covenant. Yeah, the criticism people level at this is pretty earned, but I have to say that I do really like the idea of the ‘Covenant Fringe’; races encountered by the Covenant that were never integrated into it, but provided some light advantages to their infrastructure. It makes the Halo universe feel a whole lot bigger, conveying a sense that what we’ve seen isn’t all there is – an easy trap to fall into when each piece of media is using the same species and titanic organisations. That’s why it feels so jarring, as we don’t typically see new races crop up in the series (indeed, there’s more than enough that needs fleshing out for the currently established species). It gives the fiction more to explore in the future, more unseen history, more stories to tell. 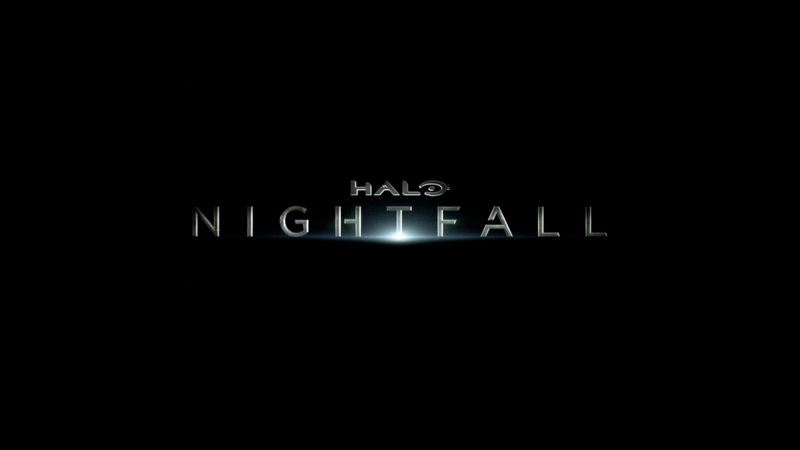 It’s been three years since Nightfall and we’ve not seen much more than a couple of passing mentions of the Fringe, but I hope that 343 does take up the opportunity to delve further into this aspect of the fiction. There’s an opportunity to tell some refreshingly unique stories with them. That comes with the caveat that I’d very much like to see aliens that are a bit more… alien, which seems to be something a lot of franchises disappointingly shy away from. Locke’s team follow the Yonhet, who we later learn is named Axl, and speculate about what he could be up to. This is, admittedly, where Nightfall might’ve further lost people because this opening dialogue between the squad… isn’t great. From the stilted and unnatural likes of “Something that would not bode well for the UNSC”, to “Drugs! Exotic fauna”, these lines are enough to put one off these characters from the start. Saying that, I don’t see it as any worse than other poorly written lines throughout the series – the likes of “To war.” come to mind. Every writer does this at some point. It’s not ruinous to the overall quality of the text, it’s just a shame that Nightfall starts off with this. Things quickly pick up as Locke observes a Spirit dropship landing at the edge of a nearby river. Suddenly, I’m back to feeling excitement again because this is the kind of thing that live action Halo is for – those things that are mundane and taken for granted as an aspect of the gameplay formula are made special by seeing it used in live action. It’s simple novelties like this that I’m a complete sucker for. To the surprise of Locke’s team, a Sangheili Zealot steps out to meet Axl, who hands over a small, strange storage device that Estrin identifies as null-storage container, which has been known to be used to smuggle bombs. The CG for the Zealot has been something that I’ve seen people level criticism at, but I don’t see it myself, and it’s not something that I particularly mind. I grew up on a diet of classic Doctor Who and Sylvia and Gerry Anderson’s Thunderbirds, Stingray, Captain Scarlet, the latter three done with the glorious puppetry technique of supermarionation. There are a lot of things that get labelled as “bad CGI” that I just scratch my head at, and even if it’s true, in my mind I tend to place more importance on the story being told once the initial “that looks a bit rubbish” thoughts wear off. Forward Unto Dawn was able to be a lot more clever with its limitations, as the Zealot attacking Corbulo Academy spent most of its screentime with active camouflage on (which really heightened the suspense), but, as it is, the CG used for the Zealot is fine and its presence in the story is later used to give Locke a defining character moment. I think that part of the reason why it seems to stand out to people is due to how much Nightfall uses practical sets and effects. It stands out a lot more with that contrast. Locke and his team split up. Ramos apprehends Axl while Locke pursues the Zealot through the forest, eventually finding a sewer access tunnel that leads to the city. Before we proceed, something that I want to take a moment to praise is just how beautiful and colourful the locations and visuals are in Nightfall. Throughout the film, there’s a strong variety of colour used, which is something one expects to see with Halo. That is one of the things that has always made the series stand out – no matter how dark the stories get, that is always offset by its stylised visuals and vibrant colour palette. Nightfall is no different. We begin in a tranquil, almost fairytale-like forest (there’s an article on my mind for the future about how Halo is, in many ways, a science fiction fairytale). The armour that Locke and his team are wearing is not visually homogeneous with their environment, they look like shadows in a land where they are not welcome, which is later reflected in the story as the political, technological, and socio-economic differences between our ONI and Sedran characters come to the fore. There’s no end of thinkpieces on the significance of colour and colour psychology in media, the likes of Pixar even build their films with ‘colour scripts’ in order to “map out the colour, lighting, emotion and moods in a film”. So I made one for Nightfall‘s first act. You can clearly see it’s an area where a good deal of thought went into, which is to be expected from a film carrying Ridley Scott’s name on it – whatever else there is to say about his films, their use of colour is a defining aspect of his visual storytelling. The prologue opens with a minimalist image lit by a warm orange colour, the room and the city outside are largely silhouetted so Randall and Natalie (and little details like Randall’s augmentation scars and the beaded necklace) take visual precedence. It then cuts to the ‘fairytale’ forest with vibrant greens, offset by the contrast of purple and blue offered up by the Spirit dropship and the Sangheili Zealot – visual interlopers. Then there’s the sewer sequence where the main source of light comes from backlighting and specific objects, like the Zealot’s energy sword. As the Zealot exits the sewer, it passes through white gates – out of the wilderness and into the kingdom of man. Arriving at the mall, we see it dominated by dark marble columns and walls, with wooden floors and a mixture of brown and red splotches on the wall – connoting the look of dry blood. After the bioweapon takes effect and the setting moves to the hospital and the base’s surrounding areas, the scene’s colour shifts to a sickly mixture of yellow and green. Then the hologram room mixes a lot of the colours from the established palette before moving back to the infirmary, then transitioning to the Condor’s interior as it travels through slipspace – lit by a deep blue, which is typically (and, in this case, ironically) meant to connote harmony. Finally, the blue then gives way to a return to the prologue’s orange, only this time it’s much harsher as we see the shard of Installation 04 silhouetted against the sun. It’s an effective visual journey through the events that take place, utilising the setting to convey the tone and atmosphere of each scene. This is the sort of thing that really goes underappreciated, that generally doesn’t move beyond subconsciousness, yet is so important as a storytelling device. Back to where we were with the story, Locke enters a city access tunnel in-pursuit of the Zealot. You’d think that Locke would be totally outmatched facing something as big as a Zealot wielding an energy sword in such a claustrophobic space. He even gets his weapon knocked out of his hand because the Sangheili has the element of surprise and gets the drop on him. He ducks the Zealot’s swing and climbs up the step-ladder in order to jump over the Sangheili, retrieve his weapon, and then run to cover behind a door, which he locks. It’s a brief encounter, but one that demonstrates Locke’s competence in a straight-up fight, which we don’t really get to see throughout the rest of the film because there aren’t any other fights like this. There isn’t ‘combat’, so to speak, so we’re shown how Locke is mindful of his surroundings and uses them to his advantage when facing off against a superior enemy. Listening at the door, the Zealot has already left and is on its way to the city rather than wasting time on Locke. Exiting the tunnels, Locke moves through crowds of people while his team spots the Zealot heading towards the shopping mall. Something that struck me as I was rewatching this that I hadn’t previously noted was… 26th century Sedran fashion. Yeah… Despite only a few short scenes, it’s clear that they actually put a fair bit into the clothes and accessories that these people are wearing. We are seeing what is undoubtedly the upper-class of Sedran society here, as this was a colony that got through the Human-Covenant war unscathed. It’s not a spectacularly wealthy planet, but it’s not quite fallen on hard times (experiencing a hundred year drought, or been reduced to glass) either – which is shown to us rather than told. I like that. This is an area where no clunky exposition is delivered to spell things out for us, it’s all in the setting details. Where the civilian life in Sedra City looks pretty good (clearly with a thriving fashion industry, just look at those outfits! ), it’s clear that the Sedran Colonial Guard hasn’t seen a lot of that monetary investment from how their weapons and hardware are only relatively modern. It’s another one of those things that becomes more rewarding to examine in-detail through rewatches, with the complete picture in-mind. (As an aside, I love the composition of this shot!) The Zealot wandering around the second floor of the crowded shopping mall has drawn its share of criticism for being silly. MICKEY: But that’s what I meant. There’s no police boxes anymore, so doesn’t it get noticed? I’m not sure whether I’m more half-joking or half-serious about that! Y’know, having worked in retail, something you learn very early on is that shopping centres have a mysterious energy field that makes the shoppers within it incredibly thick and nasty. Maybe there’s some esoteric Precursor neural physics at play with that one? Yes, it’s undeniably silly and earns its criticism, but it’s not really something to be blown out of proportion as something that’s ruinous to the film overall. What I’m more interested in is how this serves as a significant character moment for Locke, who manages to overpower the Zealot (by jumping on its back and emptying pistol rounds into it until its shields drop)… and then attempts to reason with it. This is Locke in a nutshell. Locke could have killed the Zealot there and then, and perhaps you might argue that he should have, but Locke is somebody who will always try to talk down his enemy first, rather than just putting a bullet in their head and calling it a day. Perhaps you might argue that this means the deaths at Sedra City were totally preventable, but that’s what makes it good – this is a moment that inspires debate about Locke’s application of morality. For me, this is a trait which makes him interesting and endearing to me. This is what makes him an aspirational hero. There’s a slight echo here of the ending of Halo 2, where Thel similarly endeared himself to me for life by trying to talk down Tartarus and reach out a reconciliatory hand to him. The Jiralhanae who branded him with the Mark of Shame, betrayed him by blasting him down the Library’s chasm into the clutches of the Gravemind, murdered Sangheili in the immediate outbreak of the Great Schism… and yet Thel’s first reaction to seeing Tartarus at Installation 05’s control room was to reason with him. Because the Prophets had lied to them both. He understood that they had all been lied to and manipulated, and they had the chance to do better by themselves. This is a UNSC soldier, a Spartan, and former-ONI agent who shows up on an independent colony and doesn’t stick his nose up at the people there or treat them with any scorn. That’s practically a trope at this point in the Halo universe, the air of superiority that tends to come hand-in-hand with a lot of ONI characters. Locke understands their anti-UNSC sentiments, having grown up a jaded and cynical orphan after the UNSC lost Jericho VII. So what does he do? He turns to the member of his team who grew up like the people on this colony and asks her how they might present themselves more amicably to the colonists. And now he’s going to Sanghelios and finds himself working with somebody who he’d previously signed up to assassinate, somebody responsible for the deaths of over 1.6 billion humans. He sets any grudges aside and gets to work. Dwelling on the past, causing complications by throwing doubt into the extent they can trust the likes of Thel – it’s not going to be helpful to anyone. He silently places his trust in this individual that no personal complications will arise, just as he did in Nightfall on the shard of Installation 04 where he was totally willing to play fair and give the two smugglers Arris and Haisal an equal chance of living when they were going to draw straws to decide which two get to leave. In Locke’s own words: “Things changed”. Thel ‘Vadam is no longer the same person he used to be during the Human-Covenant war, they’re on the same side now. People have the capacity to change and to be better, and Thel most definitely has worked to be better than who he once was. Locke is a rare exception in the Halo universe as somebody who will play fair, do his best to understand and get along with others, and above all do the right thing. And that’s important, I think – he’s a notable exception to the norm of how humanity is generally portrayed in this setting. That’s the kind of character I think ought to be looked up to because if there were more people like Jameson Locke in the setting then the galaxy would undoubtedly be a better place. The act of taking life has already come up as an important aspect of Nightfall’s central question, back in Randall’s soliloquy in the prologue. Locke chooses not to take life. We’re about ten minutes into Nightfall and we’re already being shown what is perhaps Locke’s most defining trait as a hero. He is disciplined and he has convictions that even apply to how he treats his enemies who wouldn’t show any such courtesy to him, and this isn’t the last time we see this – both in Nightfall and in Halo 5. The Zealot, true to its rank, chooses not to take Locke’s offer and throws itself off the balcony – falling to its death as it activates the stasis container, sending a red wave of energy through Sedra City. At first, nothing seems to happen. Locke and his team are on their way up an escalator speculating about what just occurred when people suddenly start gasping, their veins turning black – including two of the ONI operatives. The scene immediately cuts to Locke and his team moving their affected comrades to the Sedra Colonial Guard hospital, where Locke’s path crosses with Randall for the first time. Something of note about the cinematography in this scene is that Randall and Locke are never fully in the same shot. When they both occupy the screen (like in the screenshot above), one of them is out-of-focus. When Locke’s team is stopped and he insists to Randall that they have clearance, the camera cuts between them – framed from behind so we don’t see Randall’s head, just the Sedran uniform. In the language of cinematic storytelling, this is a really effective kind of ‘visual frustration’ that establishes the distrust and apprehension between the two of them. When each of them has a line of dialogue in this scene, the camera cuts to a close shot of their face, leaving the other out of the frame. Naturally, Randall’s first port of call for blame is ONI, which is why he stops Locke’s team from entering the hospital at first. Here, Locke does something important – it’s another character-defining trait of his. He assumes the middle ground. Locke is able to put aside the politics between the organisations that he and the person standing in his way work for. He appeals to Randall’s humanity, as a fellow soldier who has wounded in need of treatment. We’ll continue to see this at-play throughout Nightfall, and, as I’ve already brought up in the quoted passage about Halo 5, we see this reflected in the game as well with regards to how he approaches dealing with Governor Sloan on Meridian and Thel ‘Vadam on Sanghelios. Randall looks at the affected ONI operative – Jordan Gaines – and sees that she is suffering, which almost immediately wins him over. Because in that situation there is no ‘ONI’ or ‘Sedrans’, there’s just people who are dying and the question of what you’re going to do about it, to turn Randall’s soliloquy from the prologue back on him. Interestingly, the camera very briefly cuts to Horrigan when Locke suggests putting politics aside to Randall. That’ll be important later… At this point, we get our second soliloquy from Randall – one of a couple which are really quite superfluous. I say this is superfluous because the scene itself, what we’re shown, does a fantastic job of showcasing the fallout, the raw chaos, of the attack (topped off with a dose of fanservice by showing lots of muscly, mostly-naked blokes). It’s a moment that doesn’t need to have any dialogue narrating what’s going on. The slow piano track is all the narration that’s needed, with Locke’s team being decontaminated, followed by Locke looking out of the window at all the people who have been affected and are suffering. Even the structure of the building itself is made to look like a series of frames, reminiscent of Alfred Hitchcock’s Rear Window. Only these aren’t meant to make a statement about connecting the protagonist’s voyeurism with our own, it’s like a morbid painting or tapestry where each ‘window’ has patients suffering within it and the doctors are frantically moving around, across each frame, trying to handle the situation. The composition of this introduction to the scene is gorgeous, with each member of Locke’s team standing opposite one-another – the light of the screen taking up a significant amount of Locke’s side on the left, whereas the light is diminished and has a sickly yellow tint to it on Horrigan’s side on the right. Ramos and Estrin standing opposite one-another is significant as well, as, much later in the film, Ramos tries to convince Estrin to take his side when it comes to escaping Alpha Shard in the tug. Estrin refuses (and, earlier, throws away Ramos’ TACPAD where he has a video of his children) and that’s what leads to Ramos killing him when the opportunity presents itself. Incidentally, we also learn in this scene that Ramos is a medic, which adds some additional weight to his actions later because he violates his Hippocratic Oath. No attention is drawn to it, Locke just says “Talk to me, medic” to get an update on the situation. Bonus points for subtlety! Sergio Mimica-Gezzan’s directing in Nightfall is honestly just fantastic, it’s one area which I think is leagues ahead of Forward Unto Dawn. This is effective visual foreshadowing that, again, you simply don’t pick up on when you’re watching it for the first time. This is also where we learn that this ‘bioweapon’ is actually an element that selectively targets humans, there are no reports of any aliens being affected (it was earlier established, after the introductory text after the prologue, that eight percent of Sedra’s population are aliens). Horrigan remarks that the Covenant have found their Holy Grail, a way of wiping humanity out without needing to fire a shot when they’re supposedly (which Locke emphasises) not even at war. Horrigan then wonders why the Covenant would hit an Outer Colony like Sedra when they could use this weapon on major population centres, to which Locke responds that they’re likely using Sedra as a test run for a much bigger attack. Something that I really like about Sedra’s visual presentation in Nightfall is how ‘lived-in’ it feels. It’s an overused term, but that’s just the effect that you get when you use this many practical sets – one of which you can see in the screenshot above of the tug (or Bactrian-class freighter, if you prefer), with some very Blade Runnery-esque lighting going on (naturally, given Ridley Scott’s association with the project) and lots of rain. This tug was used to smuggle in the element, only the pilots are nowhere to be found. This is where Locke and Randall have their second meeting. Randall is unwilling to cooperate with ONI, keeping information from Locke when he asks what information he has on the situation. Locke suggests working together on the investigation because they both want the same thing, to which Randall responds that ONI doesn’t work with anyone – it’s just them, and then all the people below. There is no equal partnership, so Randall has this unique opportunity to assert his authority over them. Once again, we see Locke play the middle ground. He respectfully acknowledges Randall’s authority to show that he’s willing to play by his rules, and then brings his motivation back to doing right by his soldiers who have been affected by this event – appealing to Randall as an equal. And yes, I’m going to gush about the framing again… Randall is framed on the left, the camera then cuts to Locke in the middle, and then we see Horrigan (alone) on the right. Once again, in terms of the lighting, you can see how these three successive frames are in two halves. The lighting is strictly on the left and as each frame moves across the characters, it settles on Horrigan with a notable absence of light – just that dark, sickly yellow-green colour that has come to be visually associated with him. This is a visual motif that we’re going to see a lot of throughout the film, so this, being the first proper moment that Locke, his team, Randall, and Macer meet (all the major characters) is an important moment of establishment. Randall is beating Axl to get information out of him, to no avail. Locke and his team arrive and Horrigan asks “mind if we step in, take a shot?” – Locke, meanwhile, notably observes Randall’s Spartan-II augmentation scars on his hands (as a good bit of attention to detail, they’re the same scars we see in Halo 4′s Scanned live action trailer). Again, we’re seeing that Locke is observant of things beyond what’s going on. He’s an ONI agent, gathering information, which comes up in a later scene between Locke and Macer. Randall says that all he cares about is Horrigan shutting up and knowing his place, blaming ONI for the attack. During this exchange, Locke is standing there, quietly listening, and recognises that nothing he says to Randall is going to change anything. So Locke shows Randall that he’s an exception. Axl reveals that the element is sourced from a place that even Sangheili Zealots won’t go, a place even the regard as “Hell”, but they’ll pay for smugglers to are willing to go there because they’re desperate and have no other options. Desperate people being exploited is another major motif within Nightfall, which we’ll later see with the characters Haisal Wari and Arris Le when we get to Alpha Shard. That’s something I really like about Nightfall, it’s all about the ‘little people’. Now, their actions obviously aren’t justified, but Nightfall does a pretty good job of painting the Halo universe in shades of grey by focusing on the people who have been left behind by the system and have to make do with what they’ve got. It’s a significant contrast to Forward Unto Dawn, which was about a training school for privileged military families within the UNSC. Moving to a hologram room to trace the tug’s journey, they discover that the “Hell” Axl spoke of is actually a fragment of Installation 04 – designated ‘Alpha Shard’ – that was partially successfully in conducting an emergency slipspace jump when the Pillar of Autumn’s fusion drives detonated at the end of Halo 1. It ended up in orbit of a star, a red giant, which exposes the surface of the ring to extreme temperatures during the daytime. Ramos points out that going back to the ring, even a fragment of it, would be a major violation of the peace treaty – neither UNSC nor the Covenant go there. Horrigan asks if that is definitely where the element came from, to which Estrin expresses confusion because there was no record of an element such as this even from when the ring was intact. This is where Macer steps in and we get our first proper meeting with her. She points out that this element could’ve been formed after the Autumn’s explosion, from the heat generated by an almost supernova-level event. Note the way that Locke looks at her when the camera briefly cuts back to show his reaction. He’s visibly quite taken aback that somebody who has figured something that his ONI team couldn’t is a private in the Colonial Guard. On Sedra. He sees that she’s clearly meant for greater things. This informs a couple of scenes between Macer and Locke going forward, particularly when they have a chance to speak on the Condor. Locke cross-references the evidence they’ve found and scans for the element in the known universe, to find that this really is a one-off and definitely came from Alpha Shard. Horrigan suggests nuking it from orbit, but Estrin interjects because the signature of a tug (just like the one used to smuggle the element to Sedra) arriving to go back to the ring is detected. With all the information they need, Locke contacts Rear Admiral Goodwin to ask for permission to go to Alpha Shard, destroy the deposits, and grab whoever is mining it in order to obtain hard evidence that the Covenant has broken the treaty. Macer then steps in to establish that there’s a ticking clock on this, due to the fast rotation of Alpha Shard which makes the surface totally uninhabitable during the day. Therefore, the smugglers are “working the night shift”, so it takes them less than sixteen hours to get their hands on this element and pass it on. Goodwin states that if Locke wants this mission done tonight then his only option is to cooperate with the Sedrans. This is where we actually get something of a negative moment with Locke. He has his mission and it needs to be done as soon as possible, so he jumps straight to business and demands to see Randall. Macer says he’s “not to be accessed”, for which the reason becomes apparent, as Locke walks in on Randall grieving over the death of his daughter. His to-the-point approach results in this rather inconsiderate moment. Now, Natalie’s death is one of the big things in Nightfall that I feel is deserving of criticism. It’s a bogstandard fridging that’s intended to set Randall on his suicidal path in the third act. It makes his sacrifice at the end come easily because it plays up the angle that he’s got nothing to live for and so he assumes the responsibility of detonating the HAVOK nuke to destroy Alpha Shard. I think it undermines a much more interesting story they could have gone with for Randall. Natalie survives the attack, but Randall still has to leave his daughter behind to go on the mission – this scene would instead be Locke walking in on Randall and Natalie saying goodbye (Natalie handing him the necklace), so it preserves the portrayal of Locke immediately thinking of nothing but the mission having that insensitive element to it. Natalie’s death frames Randall’s actions through that emotional lens, which makes his actions about her. It shifts the attention from the hundreds of casualties in Sedra City to one person in order to service Randall’s story, whereas a more interesting statement could be made for his actions (call it those Spartan-II instincts within him waking up again) if they’re driven by the larger loss of life. The death of his people makes it personal enough, it doesn’t require Natalie to be killed off to hammer in the point further. Not to mention that it’d give a greater sense of inner-conflict for Randall during the mission when they have the prospect of only two of them surviving. He’d still have that ‘Spartan-II death drive’ that he has in the film, but he’d want to get back to Natalie too because otherwise she’s going to lose her father. Another reason why Natalie should live is that Locke is himself an orphan. Nightfall’s ending lacks a good denouement, which is one of the major criticisms attributed to it (and a lot of 343’s works in general). Locke’s own backstory isn’t touched on too much in the film proper, but it goes that he was orphaned when Jericho VII was glassed in 2535 and raised for much of his early life in a state orphanage. The closing dialogue from Randall is about whether Locke will give or take life when his time to die comes, as we see Locke walking through Sedra City among the ‘little people’ he fights to protect. I think a far more effective ending could’ve been achieved if the final scene showed Locke going back for Natalie. What becomes of her could be left ambiguous, or she could become a major character in her own right some years down the line – the daughter of a Spartan-II forging her own legacy, serving as a parallel to Rion Forge, even. The point is that this leaves doors open for future stories, which has more to do with the idea of Locke ‘giving life’ than that final shot of him walking through a crowd of people. As it is, there is still something in seeing Locke’s visibly shaken reaction to Natalie’s death – seeing a parent grieve the loss of their child, where he was a child grieving the loss of his parents. But Natalie’s death is ultimately something that I think cheapens Randall’s narrative. That’s my major criticism of this film. Next, we’ve got this beautiful image that goes back to what I was saying earlier about the novelty of seeing something as simple and mundane (within the context of the games) as a Spirit dropship landing in a live action production. This time, we’re seeing it with the Condor. The ‘Super Pelican’. Built using the general frame and profile of a Pelican. but with a few added extras – like a slipspace drive. The lore surrounding the Condor is quite interesting too because the Outer Colonies have been using them to further consolidate their autonomy from the UEG, enabling traders to travel longer distances and establish trade routes without having to deal with any of the bureaucratic interference surrounding commerce between colonies. The Condor is something that seems like it was made to fit the needs of production for this film, but it actually ended up being something that contributed to an aspect of the lore and the wider universe. There have been a lot of complaints about some of the more bombastic additions to humanity’s arsenal in 343’s fiction. This isn’t one of them. Oh, and it looks pretty. And it’s a(nother) really cool practical set. I like the Condor (it’s fun to use in Halo Wars 2 as well, which endears me to it further)… It’s a far more obvious point to make about the framing here than it has been in other instances, but you’ve got the Sedrans on one side and ONI on the other with the nuke in the middle – indicative that there’s more of a personal time bomb that’s counting down to go off between these two sides. As the Condor travels through slipspace, Ramos watches a recorded video of his two children on his TACPAD – glancing around to see if anyone has their eye on him before kissing the image. It’s a nice moment of vulnerability that is obviously there to tell us that Ramos is going to die horribly at some point, but the mistake that a lot of people make is thinking that Nightfall does anything to leave any ambiguity as to who is going to die. It doesn’t. Nightfall plays it straight from this point forwards, going into the second act – that’s really not a fault of the writing, that’s just how the story is. Tensions escalate as Estrin asks Macer if she’s ever seen a HAVOK nuke before, to which she responds only in simulations. Estrin presses her further, asking if she’s seen battle, his intentions being quite clear from the smug look on his face (and the fact that he’s asking this of a nineteen year old). Macer tells him that Sedra has been in a state of perpetual war, surrounded by enemies, and that Sedrans are born fighting. Horrigan remarks that that may be, but a single mistake with the HAVOK will mean that none of that matters, asserting this as the reason why only ONI should touch it because “this is our mission”. Randall steps in and says that this is a Sedran operation. Horrigan interrupts, saying that it’ll be ONI who sets the nuke and will probably end up being the ones nabbing the smugglers. Randall requests that Locke muzzle Horrigan, which Locke obliges. Once again, the framing in this exchange has Randall on the left, Locke in the middle, and Horrigan on the right. The dedication to consistency here with the directing is admirable. Addressing the whole group, Randall spells out the parameters of the mission regarding the ticking clock with the sun, making it clear that anyone still on the surface of the ring by sunrise will die. He concludes with one of my favourite lines in the film. Randall holds everyone to a professional standard because obviously the mission isn’t going to work if their politics are getting in the way, so he casts that aside and appeals to them as equals – a team of soldiers fighting for a common cause. This is, of course, set-up for events that occur in the second act that drastically alter the nature of the mission. As Randall walks off, Horrigan approaches Locke and tells him that, when the chips are down, Locke is the only person he’ll listen to. The scene that follows is another one of my favourites, it’s another solid character moment for Locke. Macer tells him that Horrigan and Estrin are wrong about the Sedrans, that they can fight, to which Locke responds that she won’t tonight – clearly indicating that this mission isn’t an opportunity to play the hero in pursuit of proving something to ONI. She then says that Randall is right about “you”, which gauges his interest before Macer specifies that she means ONI and how they think they’re better than everyone else and the ultimate difference between them is the training. Locke sees an opportunity here and starts testing some boundaries to see what makes Macer tick. The camera cuts back to a close shot and Locke’s got a very smug grin on his face, which is delightful to see because it’s showing that Locke does have some of that trademark ONI arrogance. He’s not disguising how much he’s enjoying this conversation, even as Randall says “She should be neither”. Macer goes to leave, but Locke insists on pushing further – deciding to make the subtext become text, telling her that Randall used to be a Spartan and even showing her his service record. Again, Locke is grinning through this entire exchange – the implication being that he’s ‘figured out’ Macer from this single conversation and that she wants to be a Spartan, given that she’s Randall’s protégé. Remember earlier in the hologram room where he was taken aback that she’s just a private first-class, yet demonstrates quicker intelligence than even his own men? Locke is verbally shoving Macer to think about fulfilling the potential that he sees in her, potential that Randall is evidently holding back like a concerned parent because of her age, because of the loss of his own daughter, and because his own experience with the Spartan program is that it took everything away from him. Randall calls Locke to the cockpit as they’re coming up on Alpha Shard and Locke’s demeanour changes completely, adopting the professionalism required by the mission. I’m not going to beat around the bush here, it is people missing stuff like this and calling Locke a “bland” character that makes me roll my eyes. Is it so much to ask for people to just… y’know, pay attention? We’re literally half an hour into Nightfall at this point, sixty minutes left to go (the pacing of the film’s three acts being almost exactly thirty minutes is another solid aspect of its structure) and we’ve had numerous occasions where Locke’s most defining traits have been shown to us. Not told. This is the kind of storytelling that people demand, and rightly so, yet, when it’s given, people just decide to ignore it – or wrongly claim that it isn’t there. As far as introducing a new character to this long-established series goes, Nightfall hits all the right notes where it counts when it comes to Locke, it continues to do so in the episodes we’ve got left to cover. And we do see a number of these traits carry over into Halo 5, which is one of the game’s more positive aspects (for more on that, I’ve covered it all in my level-by-level analysis of Halo 5). I had originally intended to do this whole rumination as one article, but we’re over 9500 words in and I’ve just got to the opening minutes of the second of five episodes… it appears that I’m going to have to split this up because I still have seven whole pages of notes to cover. 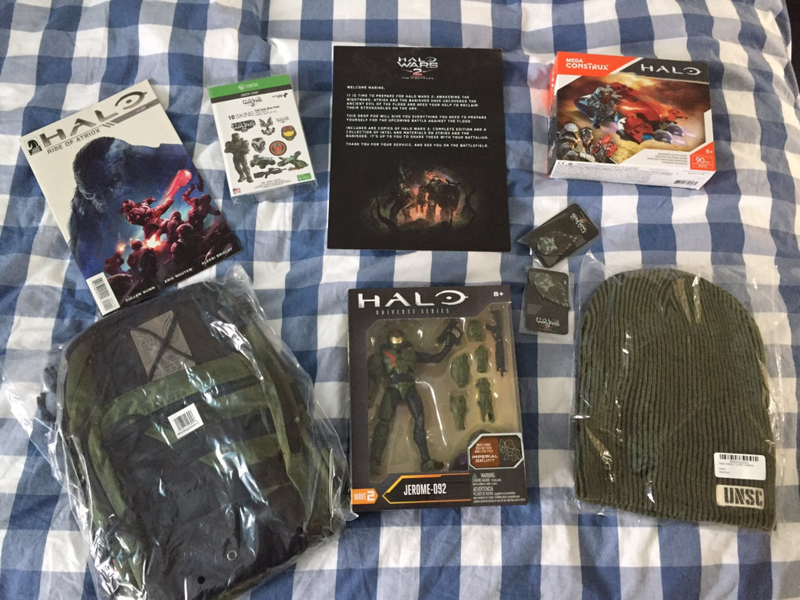 Before we finish here, I do have a gift for one lucky reader who’s made it this far… Last week, I came home from work to find that 343 had sent me a care package filled with Halo Wars 2 goodies. I’d like to extend a huge thank you to them for this, and for supporting my content by including it in several Halo Community Updates. I have a couple of codes remaining that I will be including in each article I post over the next few weeks (I’ll be doing the Rise of Atriox #3 review when it releases, followed by the start of the Halo Wars 2 level-by-level analysis). I completely agree with you about Natalie and ugh I hadn’t even thought about the symmetry between Natalie and Locke that would create. Why must 343i let us down like this. I love Nightfall though, and I love this review. Looking forward to the next one. I hadn’t looked at the colours that way. I just got kind’ve frustrated that the scenes hurt my eyes a little because of how unnaturally bright a lot of the colours were, felt like it made some of the scenes somewhat hard to fully grasp visually. Hearing your explanation of it though makes it worth it. Hey Haruspis, do you ever intend on writing up an article that congregates all your arguments in favor of Fireteam Osiris? I find myself debating with people fairly often when they say there’s no character to them, and while I do my best to organize my thoughts and what I’ve learned from you, it wouldn’t come close to what you could do if you consolidate all the points you’ve made into one well-written article. It’s definitely been on my mind. It’s part of why I wanted to write this rumination on Nightfall, so I could bat for Locke (didn’t plan to do it this soon, but Grim saying he’d like to see it put it at the #1 spot on my schedule lol), and I made sure that every article on an Osiris mission in the Halo 5 analysis included as much as I could muster to talk about them (sometimes critical, but overwhelmingly net-positive). I might collate it all into an article at some point, but no plans to do that yet – and I worry that I would be just recycling a bunch of points I’ve already made.